Is it possible to plan a fishing trip that will allow you to catch—by design rather than accident—a bluegill or redear sunfish weighing 1-1/2 pounds or more? There was a time I would have answered that question with a succinct “No.” Despite the fact that these fish are widespread and abundant in North American waters, individuals that size are true trophies and probably more rare than 3-1/2-pound crappie. It’s possible to catch 1-1/2, 2, 2-1/2, even 3-pound bream, but anglers who do so rarely set out with that specific intention. If you’re dead set on catching a wall-hanger anyway, kudos to you. It can be done, especially if you pay attention to the following common-sense tactics that are sure to improve your chances of success. Fish deep. If your catch consists primarily of little bait-stealing bream, move to deeper water nearby. Small bluegills and redears aren’t particularly angler shy, but heavyweight fish prefer deep, dark, cool sanctuaries where they feel secure from surface disturbances. Fish light. Though it seems contrary to common sense rules, big bream are more likely than small fish to gently nip a bait rather than smacking it with a hard-hitting strike. That being the case, lightweight, sensitive equipment is a must. Use an ultralight spinning outfit or graphite jigging pole with a soft, sensitive tip. This allows you to lift up slightly and watch for the slightest bend in the tip that indicates a fish has taken your bait. Though few anglers use it, 1- or 2-pound-test line will produce many more big bream than heavier line. Fish quiet. Small bream tolerate an amazing amount of disturbance—a paddle accidentally banged against the boat, a fallen tackle box, squeaky boat seats. But big sunfish—9-inch-plus fish—won’t abide the slightest bit of commotion. At the first hint of danger, they disappear into the depths. Fish thick, hard-to-reach cover. Big bream hide where few anglers fish, growing fat in nearly impenetrable sanctuaries of dense brush and vegetation. By using a long pole to fish jigs or live baits in the heart of seldom-fished cover, you often can catch several trophy-class bluegills and redears, even under the toughest fishing conditions. Head for the thickest, out-of-the-way cover you can find—dense stands of willows, mid-reaches of lily pad beds, hard-to-reach pockets in big brushy treetops and so forth. Then position your boat so you can reach far beyond the outer edge of cover. Fish without a bobber, pulling the bait up tight against the tip of the pole, then releasing it when you’ve worked the pole to a small opening. A 10-foot pole works ok, but a 12- or 16-footer gives extra reach, eliminating excessive boat movement. Try a belly boat. Trophy bream not only hide in dense cover; the really big ones often are found in out-of-the-way waters where vehicle access is difficult or non-existent. Belly boats provide an ideal means for sampling such waters, which, because they’re lightly fished, often harbor larger than normal populations of jumbo sunfish. Put a belly boat in a small backpack with a small tacklebox full of hooks, sinkers, bobbers and small lures, grab your ultralight rod and reel, and you’re ready to hike in for adventure. Use minnows for plate-sized bluegills. 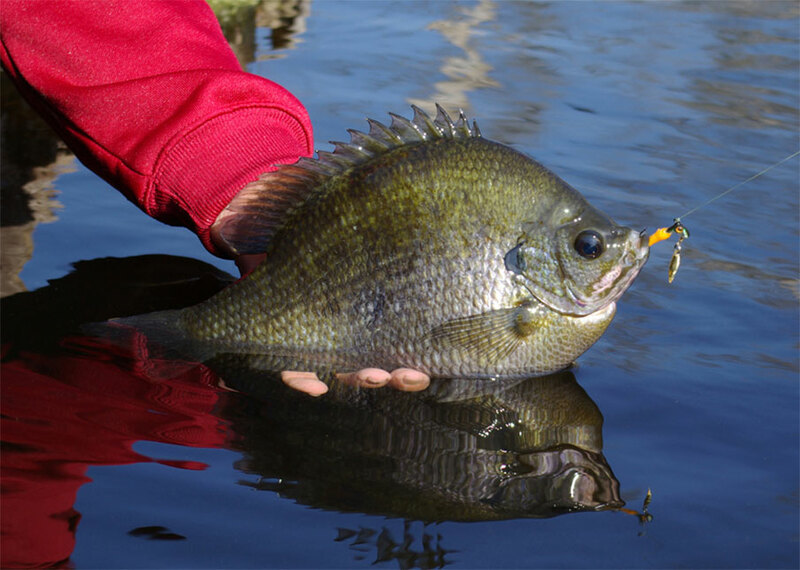 When a bluegill gets too big for an angler to reach his hand around, it often turns from a diet of invertebrates to a diet of small fish. If you’re hoping specifically to catch a trophy, try fishing 2- to 3-inch minnows. Hook the bait through both lips, not behind the dorsal fin, as it’s easier for small-mouthed bluegills to swallow this way. Present the minnow below a slip bobber, fishing bream hideouts in deeper, darker water where big wary specimens usually hide. You may have to soak a bait for an hour or more before you coax a bite. Patience is key to success. Tempt ‘em with topwaters. One- to 2-inch topwater plugs resembling natural bream forage such as grasshoppers, small crayfish, little frogs and tiny shad are excellent for catching cagey bream lurking beneath lily pads. Cast the bantam plug to an opening in or beside the pads, then let it sit, with only an occasional twitch to ripple the water's surface. A curious sunfish, if one is close by, will soon rush in to hit the lure. Give ‘em a spin. Small spinnerbaits cast and retrieved very s-l-o-w-l-y are great search tools when fishing unfamiliar waters and trying to pinpoint locales harboring oversized bream. My favorite is Blakemore’s Natural Science Trout & Panfish spinner. The 1/32-ounce size is small enough for dimple-mouthed bream to inhale and the spinner blade rotates quickly even when the lure is retrieved at a snail’s pace. I caught my biggest bluegill—a 2-pound, 4-ounce whopper—on one. Fish at night. In some waters in summer, the largest bluegills and redears feed primarily at night, just like catfish. Catch them on lures like small spinnerbaits, or use a hook, weights and bait with no bobber. Use one or two split shot to carry the bait down, then keep a finger on your line to detect a pickup while tightlining. Fish smart. The primary key to catching trophy-class bluegills and redears is knowing the right body of water to fish. To pinpoint these waters quickly, phone the freshwater fisheries division of your state wildlife agency and ask to speak to a fisheries biologist familiar with waters where these species occur. A few questions presented to the right individual can help you find several choice locations where there’s a good chance of boating a lot of big bream. Fish ponds. If there are few trophy bream lakes in the territory you fish, try to find some well-managed farm ponds to fish. A look at state-record listings indicates dozens of state-record bluegills and redears weighing more than 2 pounds were caught in ponds. Some poorly managed ponds are inhabited by tiny, stunted bream, but those with balanced populations of predator and prey fish offer excellent fishing for heavyweight bluegills and redears. Fish on bottom. Big bream, especially big redears, tend to take a position below the rest of the school, usually on or very near the bottom, even in shallow water. A tightline bait setup is the best choice for taking these bottom dwellers. Thread a small egg sinker on your line, and, below it, tie on a barrel swivel just large enough to keep the sinker from sliding off. To the swivel’s lower eye, tie a 2- or 3-foot leader of light line tipped with a cricket hook. Add your favorite live bait, then cast the rig and allow it to settle to the bottom. When a fish takes the bait, the line moves freely through the sinker with no resistance to alert fish to a possible threat. Coax redears with a worm and attractant. Here’s a trick I’ve used to catch many big redear sunfish. Bait your hook with a big gob of redworms or a night crawler, then spray the bait with YUM crawfish attractant, cast it near prime cover and fish it right on the bottom. This is a combination monster shellcrackers find irresistible. Fish in waders. Giant bluegills and redears often hide in areas inaccessible from a boat, especially on lakes with lots of shallow, flooded timber. To catch these fish, dispense with the boat and don a pair of waders. Walk slowly and quietly in shallow, brushy backwaters, using a long pole to place a bait in front of feeding fish. Watch closely for swirls in the water indicating actively feeding fish. Fish fast. If you’ve followed all the tips outlined above and still aren’t catching big fish, keep on the move, trying new locations until you find your quarry. A common mistake is staying in one place too long. If big bluegills and/or redears are present and feeding, they’ll usually let you know right away.